Get ready to supercharge your days with natural energy for fat burning and detoxification. power of apple cider vinegar to help you lose weight and keep healthy! Order Now. burning enzymes, ACV does it all. Not all apple cider vinegar products are the same. may have also tried other capsules. Forget about them! Customer Tip: Boost fat loss by combining Apple Cider Vinegar with Organic Garcinia. ... Backed By Our Real Health Guarantee! waistline and metabolism, or we'll refund every cent! ✓ All-ORGANIC FAT BURNING & DETOX: Apple Cider Vinegar is one of the most powerful weight loss compounds. It works by promoting the natural regulation of blood glucose and insulin, boosting metabolism, supercharging fat-burning enzymes, supporting digestion and ALSO boosting detoxification! ✓ SUPERCHARGED ACV GOODNESS: You may have tried Apple Cider Vinegar products before, but they were probably either too acidic or too weak. With our amazing Apple Cider Vinegar, you get none of the nasty taste, and ALL of the goodness in a super-condensed, ultra-powerful and all-natural capsule! Just take 1 - 2 capsules twice a day and enjoy all the benefits of Apple Cider Vinegar with zero hassle. 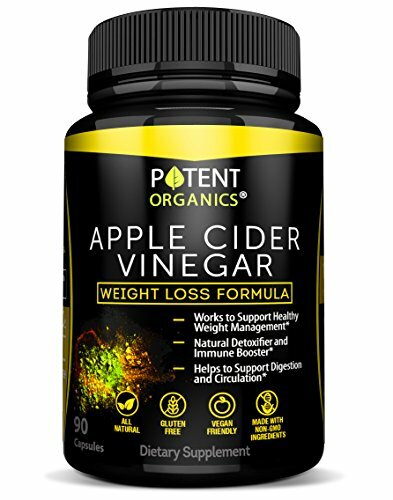 ✓ 90-DAY GUARANTEE: Try our Organic Apple Cider Vinegar Pills. We guarantee you will be satisfied with amazing weight loss and detox, or we'll refund every last cent! Our Potent Organics Apple Cider Vinegar Tablets are 100% Organic, Vegan and GMO Free. Order Yours Now. ✓ THE HOLISTIC SYNERGY OF HEALTH: Our experts agree that you can combine the incredible effects of Apple Cider Vinegar in form of a pill with Garcinia Cambogia and Green Coffee Bean Extract (both supplements are from Potent Organics). Having those two superfoods working together in your system will not only boost your weight loss, but also support healthy blood pressure, reduce cholesterol levels and even help with arthritis! If you have any questions about this product by Potent Organics, contact us by completing and submitting the form below. If you are looking for a specif part number, please include it with your message.